Gah!!! It was on of those way too busy Mondays, when you wish it was still Sunday and you can hide in bed with the covers over your head. I definitely needed a quick and easy meal for tonight’s dinner. Treehugger to the rescue!! 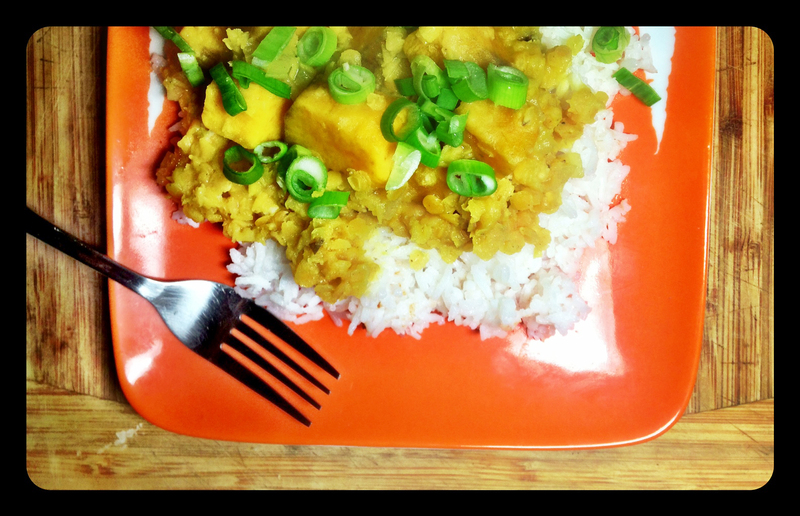 Their recipe for a simple Red Lentil and Sweet Potato curry was just what I needed. Curry is the generic English term to describe a wide variety of dishes from multiple word cusines. The similarity between dishes that are called a curry is the use of complex combinations of spices and herbs that is traditionally selected for each dish because of cultural tradition, religious practice, and family preference. Each individual dish usually has a specific name in the language of its origin describing the ingredients incorporated into the curry. In a saucepan or kettle, bring 3 ½ cups of water to a boil. In a large saucepan over high heat, warm the oil, and add the onion and a pinch of salt to sauté, stirring occasionally, until the onion softens (3 to 4 minutes). Add the sweet potato, ginger, garlic, curry powder and bay leaf and continue cooking for about a minute or until fragrant. Then pour in the boiling water and stir in the lentils bringing the pot to a boil. Reduce the heat to medium-low, cover and simmer until the lentils break down and the sweet potatoes are tender (18 to 20 minutes). Season with salt. While the potatoes and lentils are cooking, make rice basmati or jasmine rice for serving, or warm pita bread in the oven. Remove the bay leaf and dish curry out on top of rice or to eat with the pita bread. Chop green onion to sprinkle over the top along with a small (or large) pinch of chili flakes, and serve while warm. One recent comment from a Herbivore reader is that everything on the blog is so healthy. I have to admit I do not eat super healthy all the time; what is the fun in that!?! You have to have that extra fat and calories sometimes, and in my opinion, Sunday brunch is the perfect time to be a bit naughty. With that in mind, may I present my take on Jerry James Stone’s Ricotta Stuffed Sweet Potato Pancakes. Being in New Zealand, I used orange kumara instead of sweet potato and the fruit compote topping idea came from a dinner time discussion I had with a friend about easy ways to use up apples that need eating. Click here for my Spiced Fruit Compote recipe. Earlier this week, I was having the discussion about kumara vs sweet potato and if they are the same thing. Kumara is the Maori name for sweet potato; as far as I can tell they are both from the same plant family, but they are actually a different variation. Some people claim that kumara are sweeter and more flavorful, and if my memory of sweet potato is correct than kumara does have a slightly different distinct flavor of its own. The fresh ricotta came from yesterday’s visit to the La Cigale French Market, where a lovely Italian couple sells amazing Mozerella, Scamorza, and Ricotta cheeses that do not contain rennet. This is an enzyme produced in a cow’s stomach and used in cheese production to coagulate the milk causing it to separate into curds and whey. Many vegetables have enzyme properties that do the same thing, and vegetable rennet is becoming more and more popular in modern cheese production. These pancakes, fresh squeezed juice, and couple bottles of bubbles made an incredibly decadent boozey brunch. We certainly needed to take a bit of a walk after eating, but it was the perfect chance to enjoy another sunny winter day. Peel the kumara or sweet potato, wrap it in tinfoil and bake it for about an hour at 400 degrees F or 200 degrees C in a pre-heated oven; you want it to be very tender. Sift the flour, salt and baking powder into a large mixing bowl, and then add the brown sugar. Crack and separate the two eggs. Whisk the egg yolks and the milk together so they are just combined. Remove the kumara or sweet potato from the oven when it’s done and puree it either with a ricer, a stick blender, a potato masher, a fork, or any other kitchen implement that will get the job done. Add the puree to the dry mixture, mixing it well. It should create what looks like a bright orange smooth dough (made me wonder if it would be good for gnocchi). Work in the egg and milk mixture, until completely combined. Using a whisk to make sure there are no floury lumps. Beat the egg whites until they are fluffy and stiff. Fold the egg whites into the mixture, but do not overly mix it. In a buttered skillet, over a medium heat, ladle in the sweet potato pancake mixture. When bubbles form on the top and the edges look crispy, flip the cakes. While these are cooking, whisk the ricotta cheese in a small bowl, giving it a creamier texture and making it easier to spread. 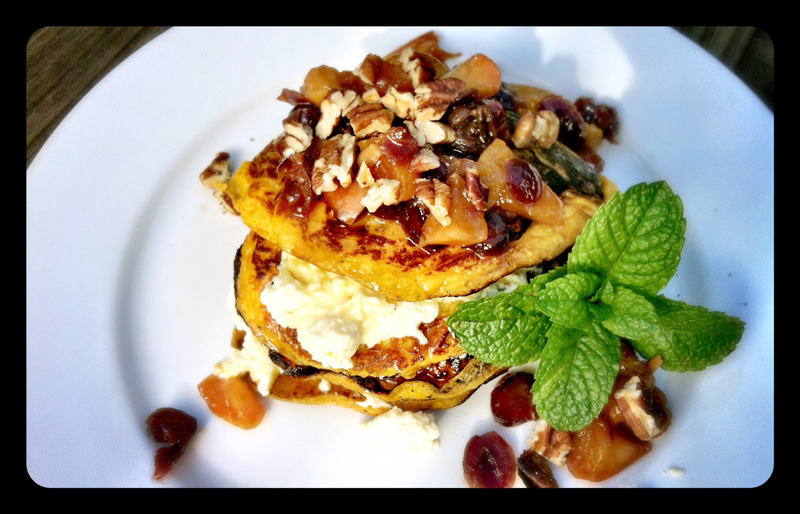 When the pancakes are done, layer them with ricotta and top with maple syrup, spiced fruit compote, and chopped pecans. I have a question for you Herbivores . . . Do you have the problem of always making just way too much food? This is certainly a problem in my kitchen; you would think a small army was coming to dinner. I am single, live with one flatmate who I rarely see, every once and awhile I will have a friend or two over for dinner, but typically there is more food made than can possibly be eaten. Realistically, there are only so many days you can stand to eat the same left overs, and while freezing food is an option, my freezer is small and can only hold so much. Plus, not everything freezes well. One of the lovely things about this recipe is that it makes small portions. It serves two, so you have enough for dinner and lunch for the next day. That being said, it is also easibly scalable just in case that small army turns up unexpectedly, or you want to make a healthy meal for your family or friends. Quinoa (pronounced keen-wah) is becoming a very popular grain in our modern society, but it has ancient origins dating back to Ican civilization. It was considered the “mother or all grains”, and today we call it a “super grain” as it is wheat-free, gluten-free, easy to digest, high in protein, and among the least allergenic foods available. It has been a staple of the indigenous diet in areas like Peru for centuries cultivated more for domestic use than international export. The only problem with Quinoa’s blossoming popularity in the western world is that it is putting pressure on the available crops causing the price to increase, making this staple food economically out of reach for some communities who have depended on it. This imbalance will hopefully be solved as more crops are currently being planted to keep up with both the domestic and international demand. I can create amazingly complicated recipes, but the simplest of foods can sometimes be a challenge. Qunioa, like rice, can be difficult to cook properly, coming out gluggy when it should be soft and fluffy, or burning to the bottom of your pan if left too long. Just like rice, I have found you can cheat by making it in a rice cooker for perfect results every time. Shhh . . . this can be our little kitchen secret. Toss cubed sweet potato or kumara with 1-2 tablespoons olive oil, and a large pinch of salt. Spread in an single layer on a foil covered baking sheet, and roast for 15-20 minutes, or until fork tender and brown. Shake or stir the pan once during cooking to stop tops from burning. In a small pan over medium-high heat dry roast the coriander seeds until they start making a popping sound and release their fragrant aroma. Keep an eye on them, because they can very quickly got from brown to burnt. Grind the coriander seeds into coarse powder in an electric coffee mill, mortar and pestle, or with the bottom of a heavy glass. In the same small pan, over medium heat, saute garlic in 1 tablespoon olive oil until golden and fragrant. Rinse the quinoa under cold water, drain, then add to the pan. Add the vegetable broth, coriander, and cumin, and bring to a boil. Cover, reduce the heat to low, and let cook 12-15 minutes without lifting the lid. Remove from heat, and let stand for another 5 minutes. Alternatively, you can add all of these ingredients to a insert of a rice cooker and let it simmer away till done. Remove the lid or your pan or rice cooker, and fluff quinoa with a fork. Gently stir in chopped cilantro, pistachios, and the sweet potato. Season to taste with salt, pepper, and cayenne. 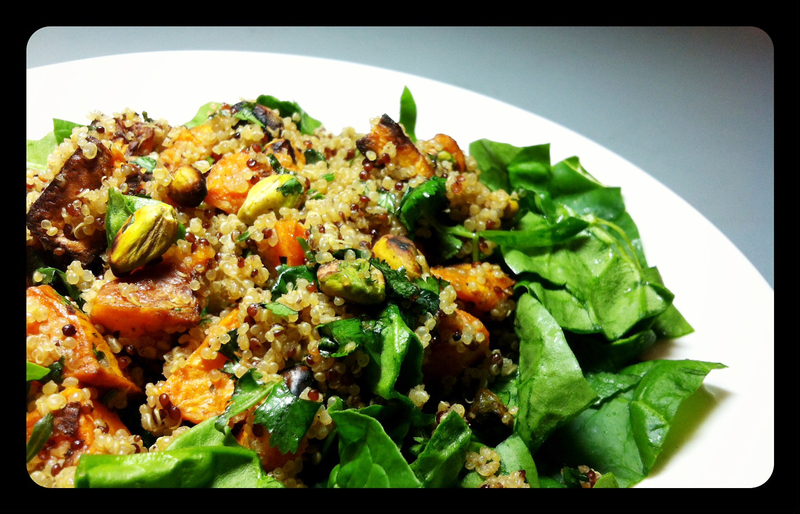 Place a good size handful of the chopped spinach on a plate and top with the quinoa mixture.